Yesterday I rode in the back seat of the van while my Dad drove me and Mom to church. How many times have I done this? Hundreds? Thousands? I'm visiting my parents this week before heading to the She Speaks Conference on Thursday. Can I just say right here that I get some of my best sleep when I visit my Mom and Dad? While I feel perfectly safe and comfortable in my own bed at home with my husband, somehow I just revert to my childhood and feel taken care of, at ease, and relatively unstressed when I lie down for the night at my parent's house. Good sleeping. But yesterday morning I pulled myself up out of a deep slumber at 7:00 to get ready for church. And we didn't just go to church; we went to Sunday School, too. I dressed in my Sunday best, we loaded up in the van well before we needed to, and, as a family, we went to church. I visited my mom's Sunday school class, as I usually do when I'm in town. I sat among the women who helped my mother raise me: my childhood Sunday school teachers, classroom school teachers, neighbors, mothers of my friends, softball coaches and piano teacher. These women are truly the ruffles and lace on the fabric of my life. There is no one who had more to do with who I am today than these godly ladies, these friends of my mother's. I feel as though I sit in some sort of hall of fame when I sit in their circle. And yet, they treat me, now almost 50 (oh. my. word.) as their equal...and I am humbled. Just before the worship service starts, my parents suggest I pop in on "my pastor," Mike Woods. I hesitate to knock on the closed door of his office, so my dad escorts me there. My dad is (in the very best sense of the term) Mr. First Baptist Powder Springs Church. No, he's not the kind that runs the church or has his thumb on everything. Instead, he's a true servant, constantly visiting people in the hospital, building wheelchair ramps for those who need them, making repairs here and there as needed, serving meals to grieving families after funerals, going on mission trips, serving on committees and as a deacon out of love and gentle service, supporting his church staff with open appreciation and a shoulder to lean on. People there respect him and love him and admire him. And he is all the more humble because of it. But I tell you all that to say, he had no problem taking me to see my home church pastor between his second and third services of the four service day. I hugged Mike and Myra Woods. He was a little damp with perspiration from preaching two heartfelt messages already. She was sweet-smelling and beautiful as always, one of the most gracious "first ladies" I've ever known. My hero and heroine. We chatted, asked about each other's kids, laughed. Mike made me feel like I am someone special. He always does. In fact, he makes everyone feel like someone special. My husband is my pastor and I love hearing him preach each week. 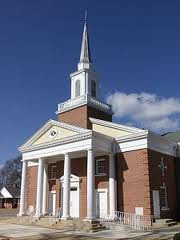 But Mike became pastor of First Baptist Powder Springs just before I headed for college and later gave me my first ministry position as interim children's minister, just before I headed to seminary. He's mentored my husband, especially when James pastored a small church in Georgia. And he's welcomed him into his pulpit a couple of times. He, along with James' dad, officiated our marriage ceremony. He is our senior and he will always be "my pastor." At first I sat between my Mom and Dad in the sanctuary. Then one of my dear, childhood friends Michelle came over from "her side" of the auditorium and joined us. Mom and I switched places and I sat beside my Mom and my friend, just like in olden days. I listened to the familiar, yet older, voices as worshiped God together. I attend a fairly contemporary worship service most weeks at my church. And I love it. I love the freedom and energy and enthusiasm with which I worship with people of so many different ethnicities. But today, as I worshiped mellow and reverent through hymns and organ preludes and quiet, it felt fresh and sweet and holy, not boring or stade. If I could worship in this sweet and and gentle, yet oh so lovely, atmosphere each week I could almost be persuaded to worship in the more traditional manner once again. Traditional here did not feel old or stuck or stubborn, if you know what I mean. Steve Jett, the beloved worship pastor, had prepared with excellence to take the people boldly to the throne room of the Most High God. And I was led. Mike preached in his unique manner...gentle, like he's sitting across the table from you, leaning in slightly, honest, and wise. He quoted C.S. Lewis and Cowper and Rudy's priest and Joni Erickson Tada. He reminded us that there is a God and we are not Him,... but we can know Him. How amazing is that! My parents' church closes each service in the sweetest way. After the last words were spoken, we joined hands across the pews and aisles and sang the chorus of the final hymn we had sung minutes earlier. But halfway through the familiar chorus, everyone raises their joined hands in the air, reminiscent of how the Who's in Whooville surely would end their church service. I always laugh a little inside when we do this, but it is sweet. They are happy people, a happy church. Many of them familiar to one another, many more of them not so well known. The church probably ran in the 300-400s when I was there in the late 80s; now they are more than double that size. But their tender shepherd's gentleness and sweet reverence permeates this diverse and growing flock, so they do not have the feel of a mega church. They feel like home. They feel genuine and real and honest. Well, I spent more time reminiscing and reflecting than I meant to. Couldn't help it. It was that kind of day. But here's what I want you to know that I learned from my parents. Are we going to church tomorrow? Why? Because church was not and is not a place you go. Church is who we were and who we are. Church is the beloved of Christ, the local flock, the brothers and the sisters, the family of God, the hands and feet and mouth of Jesus, the body. And so, on Sundays, we celebrate that. We participate. We love each other and hold each other accountable and hug and shake hands and smile and laugh and sing. Just today, my Dad shared with me how his church friends have been the most stable relationships in his life. And I wasn't interviewing him for this blog or picking his brain. He just shared that from his heart as we sipped our coffee on the back porch before loading into the van and heading to their church...my home church...our church....the church. My parents taught me...we are the church. Sorry this was so long!! Forgive me, and tell me where did you go to church this Sunday?